A delectable combination of the weird, the disturbing and the stylish, Blue Velvet is an unforgettable film experience. Director and screenwriter David Lynch dreams up a nightmare of utter human evil lurking just below the surface of normalcy, and ensures that every small quaint town will forever be viewed with suspicion: heinous people may be hiding in every shadow. College student Jeffrey Beaumont (Kyle MacLachlan) returns to his hometown of Lumberton to visit his ailing Dad, who has suffered a stroke. Out on a walk, Jeffrey makes a gruesome discovery: a discarded, severed human ear. Jeffrey alerts Detective Williams, who starts to investigate, while Jeffrey re-connects with Sandy (Laura Dern), the detective's daughter. Sandy informs Jeffrey that sultry local nightclub singer Dorothy Vallens (Isabella Rossellini), whose signature song is Blue Velvet, is in some kind of trouble and is being investigated by the police. With Sandy's help, Jeffrey breaks into Dorothy's apartment, but has to hide in the closet and watch in horror as a brute of man called Frank (Dennis Hopper), who inhales an unknown substance through a gas mask, arrives and sexually humiliates and violently abuses Dorothy. Jeffrey surmises that Frank and his men are holding Dorothy's husband Don, the former owner of the severed ear, and her child Donny hostage while Frank regularly forces her to cater to his deviant sexual whims. Despite all the warning signs, Jeffrey can't stop himself getting involved. He dives into an affair with Dorothy and starts tailing and photographing Frank and his men, uncovering their illegal activities. Frank is soon onto Jeffrey, who gets beaten up after being introduced to Frank's drug and prostitution den, where the beyond creepy Ben (Dean Stockwell) holds court. With the police moving in, Jeffrey finds himself in way over his head, as he tries to save Dorothy from Frank's insanity while the bodies pile up. 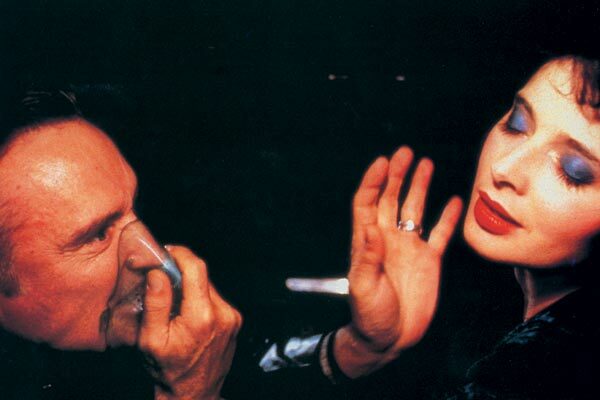 The plot of Blue Velvet matters little, and on close examination, makes even less sense. The film is an artistic canvass for Lynch to intricately paint several intertwining themes about the human and societal experience, the most prominent of which is the inevitable transition to adulthood. Jeffrey's insistence on continuously meddling with the criminal underworld appears infuriating: he ignores every opportunity to walk away from trouble. Through Jeffrey's actions, Lynch is emphasizing that there is no choice about growing up and dealing with the difficult and sometimes dangerous problems of adulthood. A second theme is what lies beneath the surface. Life in Lumberton appears as idyllic as the American dream can get, white picket fences, smiling firemen, and lazy summer days lounging in the yard. It is so surreal that Lynch infuses Lumberton with many 1950s shadings, a decade perceived as more innocent, optimistic and hopeful. Co-existing just below this veneer of perfection are the sordid criminals, and throughout his movie Lynch scatters parallels between Frank and his gang and the ugly insects just below the surface of the manicured lawn introduced in the opening sequence. A related and more complex theme that Lynch plays with is the contradiction between outward appearance and actual behaviour. Not only does society have inner secrets, every individual may harbour confounding hidden behaviours and motivations. Sandy is the daughter of a police officer, blonde, wholesome and seemingly all good. Yet she doesn't hesitate to tell Jeffrey classified police information that starts him on the road to trouble; she helps him to break into Dorothy's apartment; and she repeatedly ignores her boyfriend Michael as she enjoys the ride that Jeffrey's adventure furnishes for her. Dorothy is the dark cabaret singer that seemingly represents nothing but trouble. Yet of all the characters in the film she is the one most victimized and in most need of rescuing. Detective Williams is supposed to help but is always giving Jeffrey a suspicious look; and his partner Detective Gordon certainly proves to be much more dangerous than he first appears. Lynch is providing a reminder that for grown-ups, the game of life becomes much more complex, and both people and places are often not what they seem. Helping Lynch to deliver this kaleidoscope are four actors who have rarely been better. 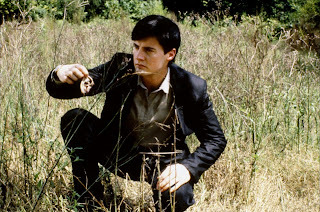 Kyle MacLachlan's movie career never flourished, but as Jeffrey he was perfect, combining innocence with an eagerness to pursue danger to its darkest corners. Laura Dern projects nothing but fresh-faced chastity while she effortlessly behaves in much naughtier ways. Her performance is a magician's sleight of hand, dazzling with a diversionary look while pulling off entirely unexpected actions: in many ways, Sandy is the most interesting and complex character in the movie. Isabella Rossellini takes on the role of Dorothy with gusto, and her performance is certainly brave: abused, victimized, yet demanding more of the same because that is all she knows, she lives in a world so black that absolute mental darkness is her only comfort zone. And finally, Dennis Hopper brings Frank to life, one of the most vile characters ever placed on the screen. Vicious, abusive, manipulative, intimidating, foul-mouthed, addicted to something through that inhaler, and without a single redeeming feature, Frank is just plain scary. In a career with several highlights, Frank is one of Hopper's stand-out roles. Blue Velvet is a one-of-a-kind searing bolt of originality that leaves a permanent and most memorable mark.